A new project will continue feral animal control measures to help protect endangered nesting turtle colonies on the Western Australian Ningaloo Coast World Heritage Area. The area of focus is the Gnaraloo Bay Rookery and Gnaraloo Cape Farquhar Rookery within the Ningaloo World Heritage Area and Ningaloo Marine Park, nesting grounds of endangered and vulnerable reptiles, including Loggerhead, Green and Hawksbill sea turtles. Support has been provided to Animal Pest Management Services by Rangelands NRM through funding from the Australian Government’s National Landcare Programme to undertake training in feral animal tracking and monitoring for nest predation, among a number of on-ground activities. Rangelands NRM Program Manager (Southern Rangelands) Kieran Massie said the project aims to increase public knowledge of the presence and significance of the sea turtle rookeries at Gnaraloo and the predation of turtle eggs and hatchlings by European red foxes, feral cats and wild dogs. “On-ground works and educational activities will collaborate and compliment previous works undertaken by Gnaraloo Station Trust, the Department of Parks and Wildlife and Animal Pest Management Services,” he said. The Gnaraloo Turtle Conservation Program has undertaken survey and management actions to protect turtles nesting on the beach since 2008. In 2008, 100 per cent of turtle eggs were being predated by foxes, which saw the establishment of the Gnaraloo Feral Animal Control Program. Each year since 2010, there has been 100 per cent protection of turtle nests from feral predation, saving over 200,000 turtle eggs in total. The Gnaraloo loggerhead population is part of and supports the third largest loggerhead population in the world, and as such, is of significant importance to the Ningaloo Coast World Heritage Area, and to the survival of the Loggerhead Turtle on a national and international level. Rangelands NRM WA is a not-for-profit, non-aligned, community-based organisation which aims to enhance the sustainable management of the WA rangelands through facilitation, collaboration and delivering outcomes. It is the largest of the 56 NRM regions in Australia, covering around 85 per cent (2,266,000 sq km) of the WA State’s land mass, and 75 per cent of the coastline. 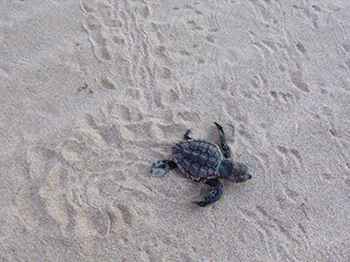 Turtle hatchling courtesy of Gnaraloo Turtle Conservation Program.